JNN 24 Sept 2014 Baghdad : The head of Iraq’s Shia Sadrist movement Muqtada Al-Sadr yesterday threatened the United States’ troops if they decide to return to Iraq. Al-Sadr called on the Iraqi government not to seek the occupier’s help even under the pretext of defeating the Islamic State, claiming the radical organization is nothing but an “American colonial invention”. Al-Sadr concluded by calling on the Iraqi fighters not to cooperate with US troops and to immediately withdraw from their areas in case those troops intervened “by land or by sea, directly or indirectly”. Iraqi people have held a demonstration in central Baghdad to protest against the US military intervention in their country. The demonstrators were holding pictures of Shia cleric Muqtada al-Sadr during the protest on Friday. Senior religious and political figures in Iraq, including, Grand Ayatollah Ali al-Sistani, have in recent days called on the Baghdad government not to rely on foreign powers in the battle against the ISIL Takfiri terrorists. Ayatollah Sistani has repeatedly called on all Iraqi people and political factions to unite and support the government and army in the fight against ISIL. The United States says it is planning to intensify airstrikes against ISIL positions in Iraq. General Martin Dempsey, the chairman of the US Joint Chiefs of Staff, has said that ground forces may be needed if current efforts to combat the ISIL fail. The United States withdrew its forces from Iraq in 2010, a year after President Barack Obama took office. ISIL terrorists were reported on Friday to have launched gas attacks on Iraqi forces in the town of Dhuluiya in Saladin Province. The town has been under ISIL siege for more than two months. 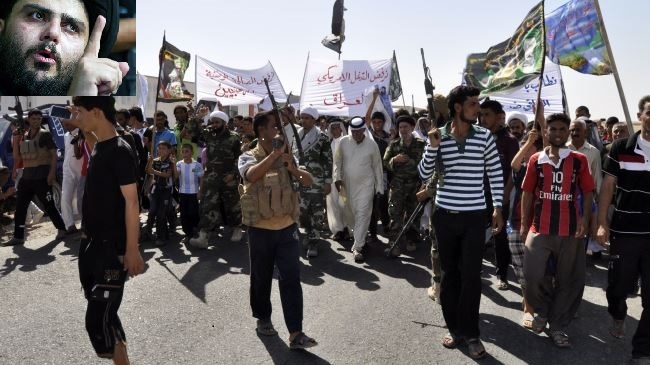 Senior Iraqi officials have blamed Saudi Arabia, Qatar and some other Persian Gulf Arab states for the growing terrorism in their country. The coalition being formed against the ISIL which is led by the US is a prelude to a new occupation plot,” part of the statement said. This entry was posted in Lebonan, Middle East and tagged Iraqi Hezbollah, Muqtada al-Sadr, Shia Population. Bookmark the permalink.